Knowledge retention is a challenge in any e-learning program, and training managers are always looking for ways to help learners retain what they have learned. This is a pertinent problem, especially when the course deals with complex topics that learners have to remember and apply in their jobs. These include topics such as complex surgical procedures, safety processes, and complicated equipment whose operation is difficult to demonstrate. To make such courses engaging, organized, and relevant, content must be simplified, broken down, and made comprehensible. There are many easy ways to include video in your e-learning courses. You can use images and text with some audio and screen captures. Another option is to use live action footage while ensuring it is easy to integrate with the course. Including videos of seminars and classroom experiences is another option. Yet another alternative is to create customized animations in Flash and use them as a video in the course. Video significantly reduces the learning curve when it comes to teaching a complicated software or process. The animations and interactions used in video are more effective in helping learners visualize the information imparted, than text and images. Video can run on desktops, laptops, and mobile devices, making it one of the best cross-platform medias for use in e-learning. All these factors make video the ideal choice to explain complex topics in a simple way. Video can play the role of an instructor when communicating facts or demonstrating procedures. Learners can view complex clinical or mechanical procedures in the form of video as many times as they wish to. The golden rule is to use video when you feel it will be the best way to explain the topic to learners. 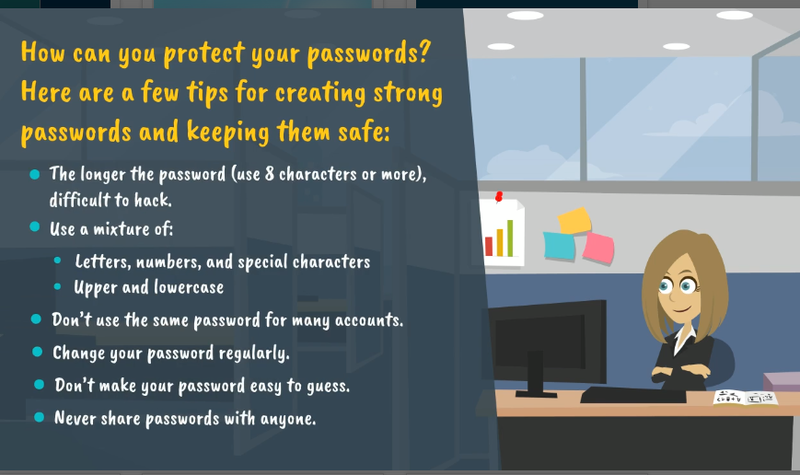 For instance, here is a screenshot of a video we created for an information security course to help learners understand the importance of protecting their passwords and preventing them from being stolen or accessed. Topics such as harassment or discrimination at the workplace can be better communicated through video. Instead of giving a list of don’ts, learners can be shown video that conveys body language and facial expressions that indicate harassment or discrimination. Video are best used when teaching complex behavioral responses. For instance, in sales training, video can be used to help sales reps recognize the subtle cues of potential customers that indicate they are interested in the product, which will help the salesperson push the sales pitch further. Video can be useful to explain complex safety procedures to learners and will make a greater impact if they are of employees sharing their experience of handling risky situations. This makes the topic more relatable and relevant. Consider using video for soft-skill training; this will be better than using only theory or having a multiple-choice question game. For a course on leadership skills, a video of two employees arguing over an issue and asking the learner to respond to the situation by giving him multiple options will help him learn based on the feedback he receives for his responses. Video with high-quality visuals and audio can simplify complex concepts and theories, and stimulate learners. When the learning process is entertaining, learners are bound to pay attention. But remember to set your video in context so that learners are aware of what they are watching and why; and the takeaways they are expected to gain. Again, these videos should not be lengthy; they will not make an impact in this age of learners with short attention spans. When video is used to explain complex topics, it makes the topic easy to understand and supports the acquisition of new concepts. For learners, it reinforces learning, is visually stimulating, and holds their attention. The combination of visuals and text in a video is certainly a better way to learn, rather than text-only content.